Sonakshi Sinha's elder brother Kush tied the knot with Taruna Agarwal in a lavish wedding on Janaury 18. The new couple's wedding reception, held at a suburban five star hotel in Mumbai on Monday, January 19, was graced by top Bollywood stars and politicians. 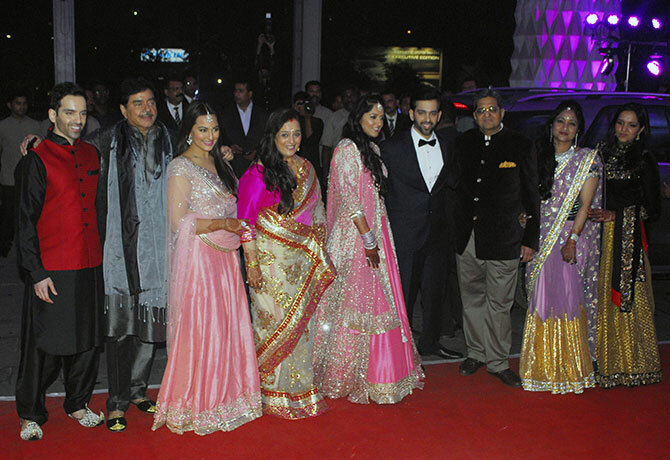 The Sinhas -- (left to right) Luv, Shatrughan, Sonakshi and Poonam -- are seen here with the Agarwals as they pose for pictures with the new couple. Lingaa star Rajinikanth was accompanied by elder daughetr Aishwarya R Dhanush. 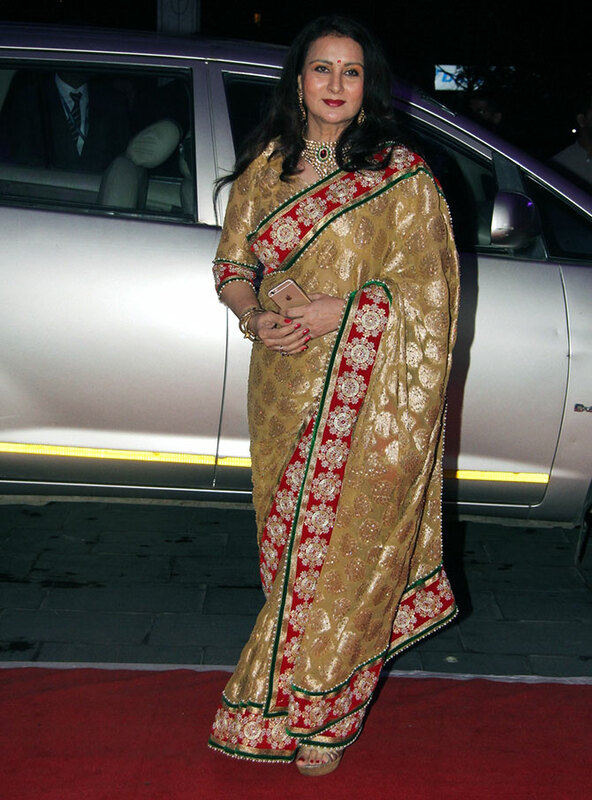 Veteran actress Rekha, dressed to the nines, arrives in style. 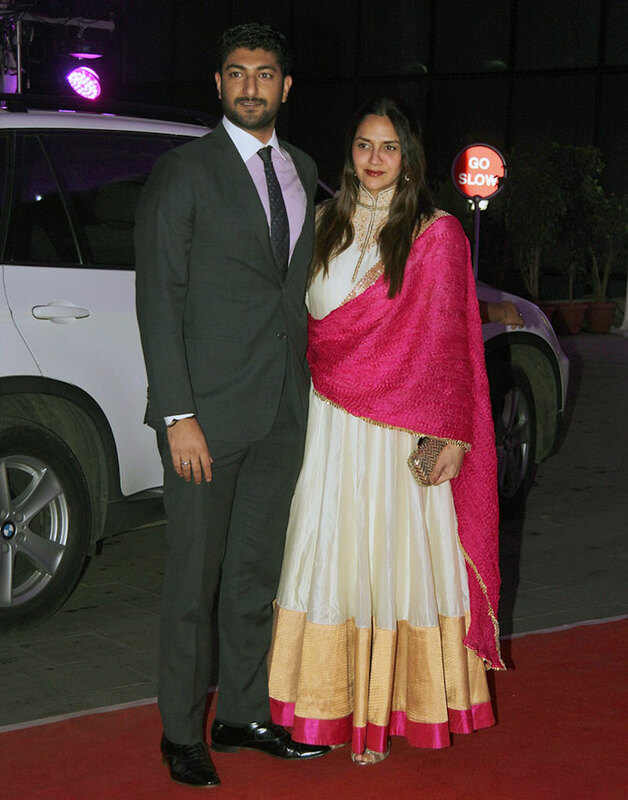 Hema Malini and Dharmendra's younger daughter Ahana Deol arrives with husband Vaibhav Vohra. Veteran actress Poonam Dhillon was also present. 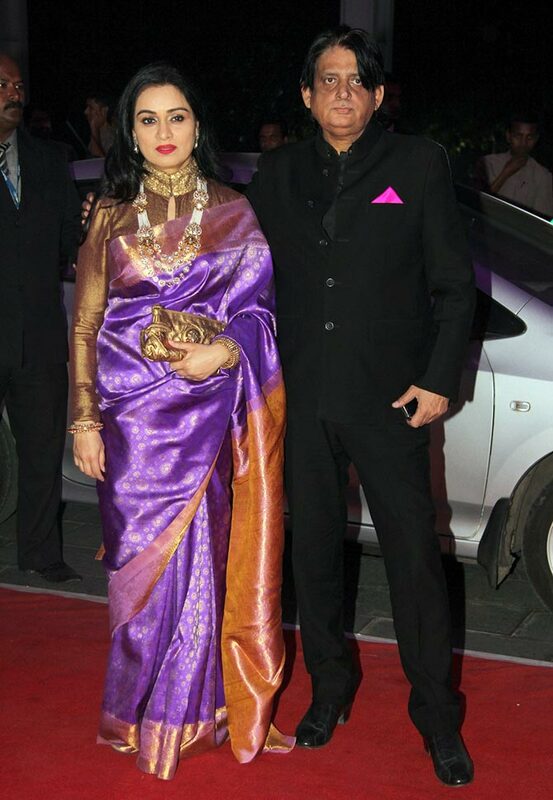 Film producer Tutu Sharma puts in a rare appearance with actress wife Padmini Kolhapure. Tseries head Bhushan Kumar stands proud next to wife Divya Khosla, who looked sensational in her deep red outfit. 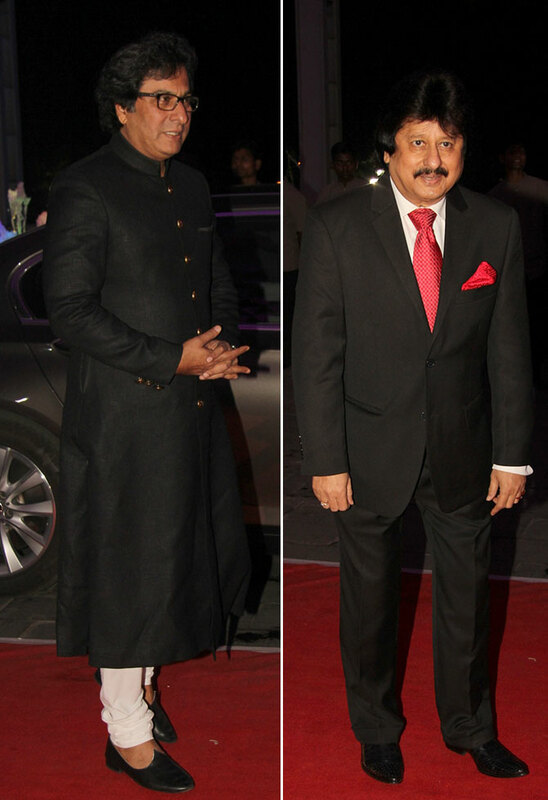 Ghazal singers Pankaj Udhas and Talat Aziz were impeccably dressed for the occasion. 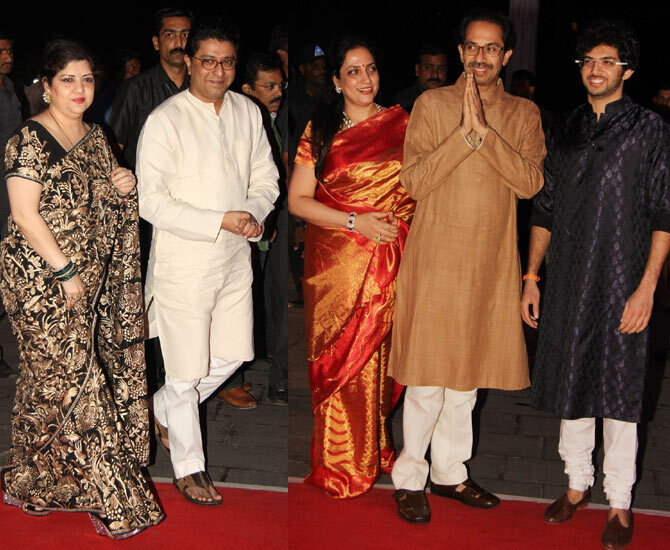 Actors Riteish Deshmukh, Sonu Sood and Arjan Bajwa were some of the best dressed guests at the reception. Kajol arrives with father-in-law Veeru Devgn. While younger sister Tanissha Mukherjee sizzled on the red carpet in a sensational lehenga. Maharashtra Navnirman Sena chief Raj Thackeray arrives with wife Rashmi while cousin and Shiv Sena supremo Uddhav Thackeray was joined by his wife Rashmi and son Aditya. 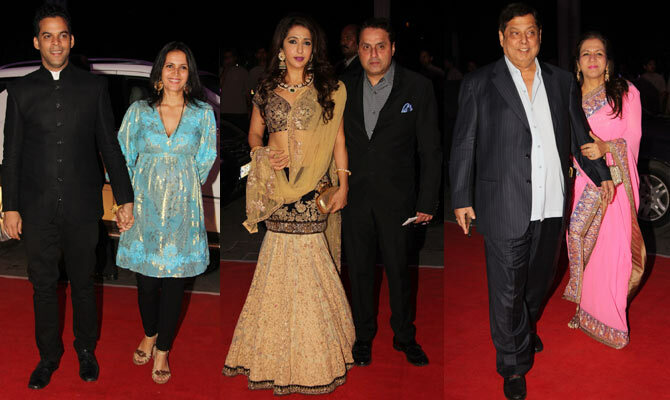 Madhur Bhandarkar and wife Renu, Ramesh Sippy and Kiran Juneja, and Shilpa Shetty's parents -- Surendra and Sundanda Shetty -- arrive. 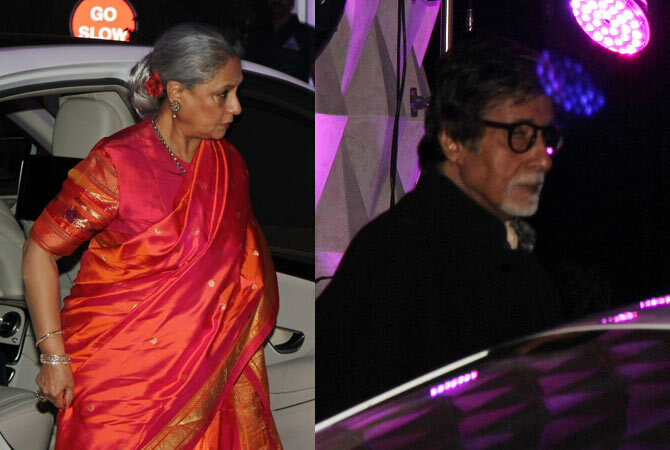 Jaya Bachchan and Amitabh Bachchan were also in attendance. 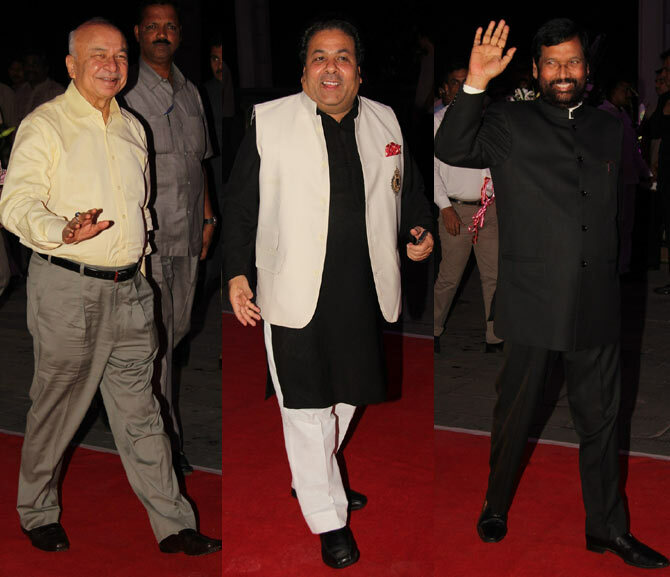 Politicians Sushil Kumar Shinde, Rajiv Shukla and Ram Vilas Paswan, photographed at the do. 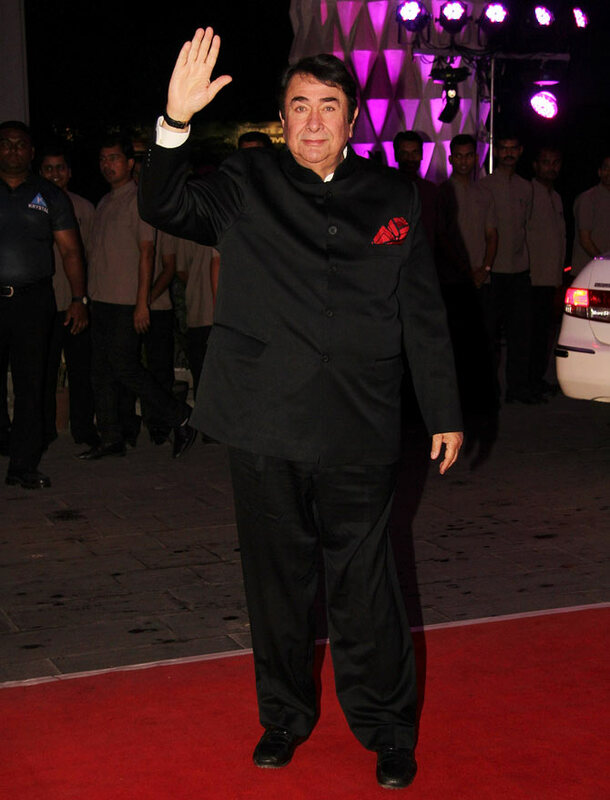 Former cricketer Mohammed Azharuddin and (a visibly slimmer) Sunny Deol were dressed in black. 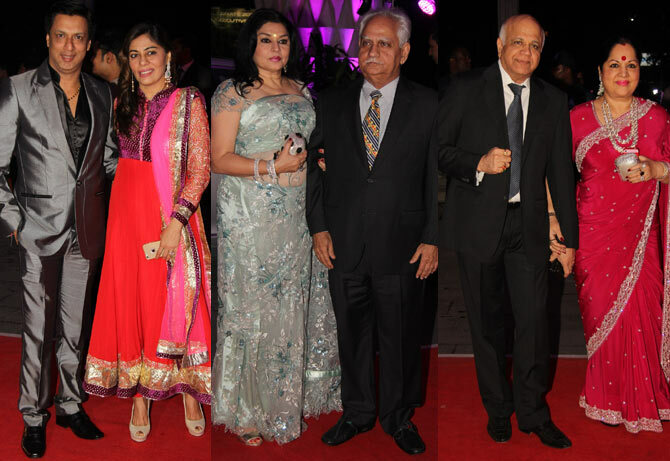 Vikramaditya Motwane and his photographer wife Ishika, Sunil and Krishika Lulla, and David Dhawan with wife Karuna are seen here making an entrance. 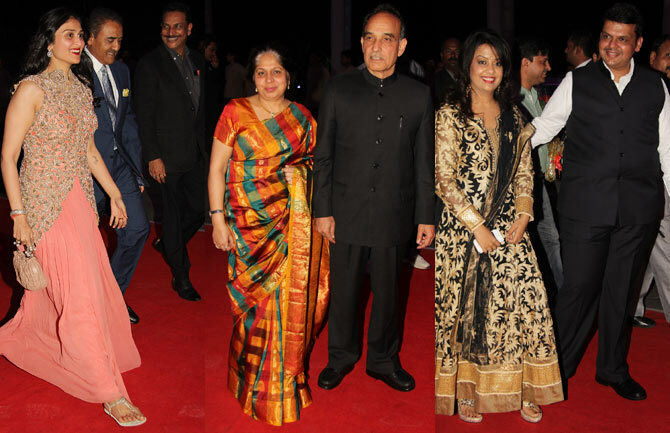 Praful Patel, former Mumbai police commissioner Satyapal Singh, and Maharashtra Chief Minister Devendra Fadnavis with wife Amruta were also spotted. 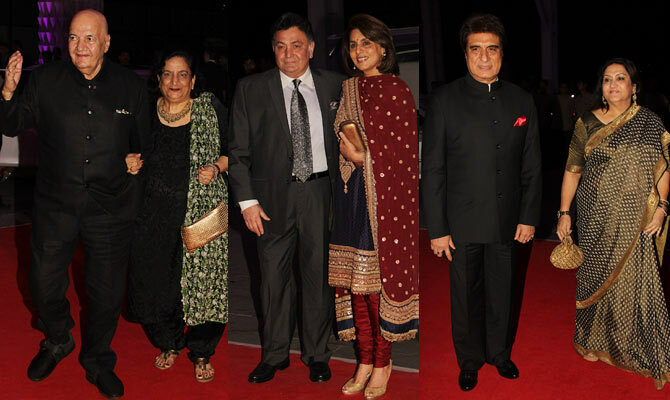 Bollywood veterans Prem and Uma Chopra, Rishi and Neetu Kapoor, and Raj and Nadira Babbar pause for pictures on the red carpet. 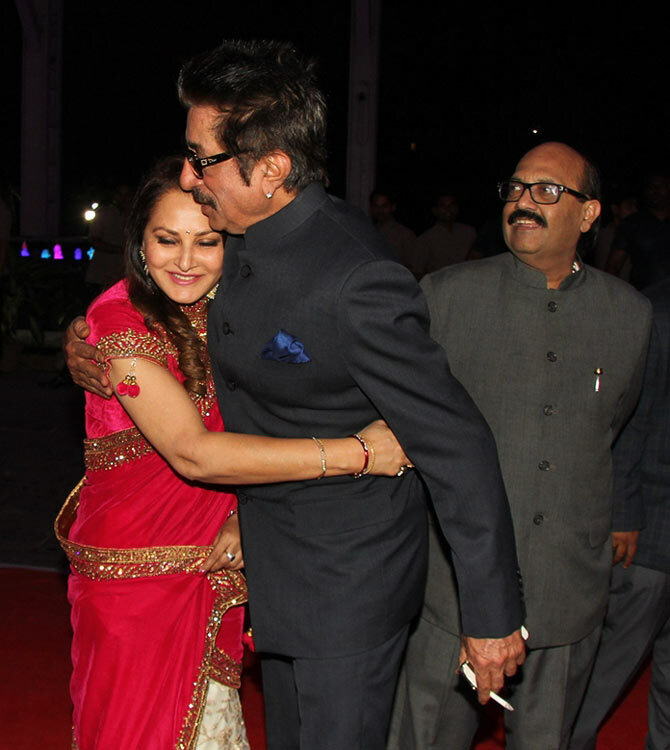 Jaya Prada greets Shakti Kapoor as Amar Singh looks on. 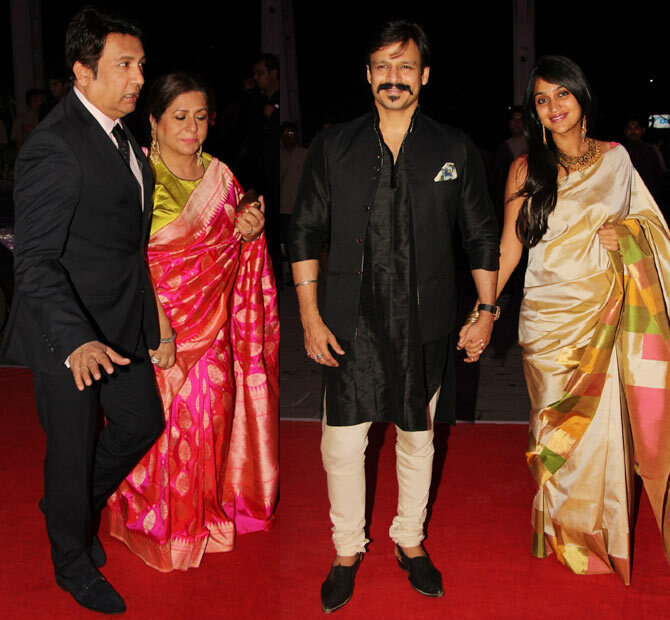 Shekhar Suman arrives with wife; Vivek Oberoi escorts wife Priyanka Alva to the venue.